The Zoho Reports Advanced Analytics Add-on for ManageEngine ServiceDesk Plus enables you to easily analyze your ServiceDesk Plus (SDP) data. Its intuitive drag-and-drop interface allows you to quickly create insightful reports and dashboards. ITIL/ITSM managers can 'slice and dice' their service desk data the way they want, analyze key service metrics and take informed business decisions to optimize their business operation. 1. What is Zoho Reports? 2. What is the Zoho Reports Advanced Analytics/Reporting add-on for SDP and how does it work? 3. Who can setup/subscribe to this Zoho Reports add-on? 4. What do I get / What is the value add I get, when I subscribe to this add-on? 5. How does the Zoho Reports add-on for SDP work? 6. What are the default reports & dashboards created by Zoho Reports, on setting up this add-on? 7. How secure is Zoho Reports to store my SDP Data? 8. Will sensitive information from SDP uploaded into Zoho Reports? 1. How much does this add-on cost? 2. Do you provide trial evaluation for this add-on? 3. What do you mean by 'Users' in the (add-on) pricing plan? 5. How do I purchase a paid plan in Zoho Reports? 1. How do I setup the Zoho Reports Add-on in my SDP account? 2. I have setup the Advanced Analytics add-on but not seeing my SDP data in my Zoho Reports account. What's happening? [or] How long should I wait for my SDP data to initially appear in Zoho Reports? 4. What are the default fields that will be synchronized in Zoho Reports reporting database? 5. Can I add custom columns or new fields? 6. Can I edit the SDP-Zoho Reports synchronization setting? 7. Can I synchronize the SDP-Zoho Reports data instantly? 8. How do I access the reports created in Zoho Reports? 9. How to create my own reports with this add-on? 10. Who has access to the reports I create? 11. What are the modules in SDP on which I could create reports using this add-on? 12. Will other modules in SDP be supported, for report creation through this add-on & When? 13. On whose account will the Zoho Reports add-on be setup? 1. What are the report types supported by Zoho Reports? 2. What are the default reports & dashboards created by Zoho Reports, on setting up this add-on? 3. Can I modify the default reports that have been created by the Zoho Reports add-on? If so, how? 4. How do I create reports using Zoho Reports with this add-on? [or] What are the reports that I can possibly make using this add-on? 5. How do I create reports using fields/columns across different tables (example Requests & Tasks etc)? 6. What are 'Formulas' in reports? 7. What are the default formulas added by Zoho Reports, on setting up this add-on? 8. How do I create my own custom formulas in Zoho Reports? 9. Can I add/modify SDP data from within Zoho Reports? 10. Can I add new columns to the SDP tables data in Zoho Reports? 11. Can I add new data tables in this reporting database to create reports & dashboards? [or] Can I combine data from other sources with the data from SDP to create reports and dashboards? 13. Can I join data from multiple tables to create reports?14. How do I generate a bookmark URL or permalink for a report or dashboard? 1. How do I share the reports in Zoho Reports with my colleagues? 2. Why are other members in my organization not able to access the reports created? 3. How can other members in my organization create reports? 4. What are the user roles available in Zoho Reports? 7. How can I print the reports & dashboards created in Zoho Reports? 8. How can I email reports & dashboards created in Zoho Reports in a scheduled manner? 9. Into what file formats can I export the reports & dashboards created in Zoho Reports and how? 1. How do I get technical support on Zoho Reports add-on? 2. Can I have someone from Zoho do a demo of this add-on for me? Zoho Reports is an on-demand reporting and business intelligence solution that helps you get new insights on your business information through its powerful and flexible online business intelligence engine. You get powerful reports in minutes, with no IT help. It offers the following important capabilities. Powerful drag & drop based reporting features for quick report creation and publishing. Visual Analysis capability for in-depth analysis and to slice & dice your data. Supports data import from variety of file formats including Excel, Open Office, CSV, TSV, HTML, XML and JSON. Data can also be imported from Cloud Storage/Drives (Google Drive, Zoho Docs, Dropbox, Box and OneDrive) and Web URLs. Also supports periodic scheduling of import. Integrated with ManageEngine ServiceDesk Plus (SDP) to provide advanced analytics on data collected from SDP. Similar integrations available for popular business applications like Zoho CRM, Salesforce, Zoho Projects, Zoho Recruit, Zoho BugTracker etc. Supports reports creation by joining data across related data sets. SQL (Structured Query Language) driven querying is also supported for powerful report creation. Real-time collaboration by sharing data, reports & dashboards in read or read-write modes with your colleagues. You could also notify reports via email. Email, Export and Print Reports in variety of formats. You can also setup scheduled emailing of reports. Highly secure through user login with support for HTTPS (SSL connection). All your data and reports are hosted in highly secure datacenters. 2. What is the Zoho Reports Advanced Analytics add-on for ManageEngine ServiceDesk Plus (SDP) and how does it work? The Zoho Reports Advanced Analytics add-on for SDP brings in all the capabilities of Zoho Reports described above, to SDP. It comes with the following features/benefits. Drag & Drop based reporting & analysis that could be used by any business user. No technical knowledge required. No Scripting/Querying required. Collaboratively work with your colleagues when creating new reports/dashboards on your SDP data. Easily share & embed the reports you create. 3. Who can setup/subscribe to the Zoho Reports add-on? Customers using any edition of SDP can set up this add-on. Also, you can choose any of the available plans in Zoho Reports, including the Free plan. This add-on can be set up in ServiceDesk Plus 9.0 build #9028 and above. SDP customers on builds prior to this have to migrate to 9028 by installing the required service pack(s). For configuring this add-on in your SDP account, you should be the SDP administrator. 4. What do I get / What is the value add I get, when I set up/subscribe to this add-on? As a SDP user, subscribing to this add-on brings you immense benefits. You get to look at your data in SDP in ways you haven't looked at before. Using this Zoho Reports add-on enables you to do powerful analysis of your SDP data and create insightful reports & dashboards. Like say constructing requests flow distribution, measure SLA compliance, knowing your requests closing rate, knowing your Top 5 / Bottom 5 technician, predicting how your support load in different regions is going to be in the following months and quarters, and do much more. Zoho Reports' drag-and-drop based reporting is so easy to use that you could create any report or dashboard on your SDP data with basic technical knowledge and share them to your colleagues. No Scripting or Querying required. The Zoho Reports Advanced Analytics Add-on for SDP works as below. The SDP Administrator creates an account in Zoho Reports. Refer to this slide show to know more about how to setup the Zoho Reports add-on. When you setup/configure the Zoho Reports add-on, 80+ default reports/dashboards are automatically created. These hand-picked reports will be pretty useful in analyzing your SDP data effectively. For example, SLA reports, technician reports etc. For more details about the reports supported for Zoho Reports Advanced Analytics Add-on for SDP, refer to Reporting Features section. Only the data that is required for analysis is uploaded from SDP to Zoho Reports. For example, the mail content of the request/ticket is NOT uploaded. To know what data is uploaded from SDP, refer to the Default fields synchronized from SDP to Zoho Reports question. Click the 'Reports' tab of SDP and click the Zoho Reports link at the top. You will be taken to your Zoho Reports account in a new browser tab. Click the Subscription link at the top right. In the Upgrade tab/page, choose the plan you want to subscribe to in Zoho Reports. Note 1: Ensure that you subscribe to the Zoho Reports paid plan, only from the account of the administrator, whose email / Zoho AT key is used to setup the SDP - Zoho Reports Add-on. Note 2: In case you want to subscribe to Zoho Reports through a purchase order, please mailsales@manageengine.com. The add-on is also available in the ManageEngine ServiceDesk Plus store. Yes, we do provide a 30-day free trial for this add-on from the date of setup. The free trial will enable you to try the add-on in the "Standard" plan of Zoho Reports (Refer to the Zoho Reports pricing page). You can continue to use the add-on even after the trial period, in the "Free" plan of Zoho Reports. Anyone to whom you privately share your databases, tables (data), reports and dashboards, created in Zoho Reports, for collaboration is considered a "User" in Zoho Reports. A user is identified by his/her unique email address, with which their Zoho Reports account was created/registered. Suppose you subscribe to the Zoho Reports Standard plan, you can privately share the data/reports in your account and collaborate with 4 other persons. Now your Zoho Reports account is said to have 5 users (including yourself). In Zoho Reports, a row or record is defined in the same context as in a database (or spreadsheet). In simple terms, a table consists of rows (records) and columns (fields). Each row in a table represents a set of related data and has the same structure. For example, in a table that represents "Requests", each row would represent a single request record. The number of rows calculated for pricing, is the sum of all rows/records stored across all your database tables in your Zoho Reports account. Click 'Reports' -> 'Zoho Reports'. You will be taken to your Zoho Reports account in a new browser tab. You need to log into Zoho Reports, if you are not logged already. Note 1: Ensure that you subscribe to the Zoho Reports paid plan only from the Zoho account of the administrator who set up the SDP Analytics Add-on. Get the Zoho AT key (Authtoken) by visiting this page. Use the email address of the Zoho Reports account and the Zoho AT key, to configure the SDP - Zoho Reports setup. Note: This add-on can be set up in ServiceDesk Plus 9.0 build #9028 and above. SDP customers on builds prior to this have to migrate to 9028 by installing the required service pack(s). You will be configured for a 30-day free trial of Zoho Reports Standard edition. You will receive an email after the first batch of data from SDP gets imported into Zoho Reports. Once this initial data from SDP gets imported into Zoho Reports, subsequent changes made in SDP will automatically get synchronized into Zoho Reports at the scheduled synchronization time. Refer to the below slide show for setting up the add-on, with step-by-step instructions. Click the 'Reports' tab of SDP and click the Zoho Reports button at the top. You will be taken to your Zoho Reports account in a new browser tab. Click on Subscription link at the top right. In the Upgrade tab/page, choose the appropriate plan and subscribe. After configuring the Advanced Analytics in your SDP account, wait for at least a couple of hours for all your SDP data to be imported into Zoho Reports. You will receive an email when the import/sync is complete and is ready for creating reports over the same. Once the initial data synchronization is done, subsequent changes you make to your data in SDP (add, modify, delete records) will automatically be synchronized into Zoho Reports at the scheduled times you have specified during setup. The import/sync process of your SDP data can fail sometimes, due to a variety of reasons. And hence you may receive such mails occasionally. No worries. Please mail to the ServiceDesk Plus's support team (servicedeskplus-support@manageengine.com). They will look into it immediately and get back to you taking the required corrective action. Setup Process Failed mail will come when there is a failure during the initial SDP - Zoho Reports add-on setup. Synchronization Failed mail will come if there is any failure during the data synchronization process between SDP and Zoho Reports, after the initial setup & import is completed successfully. 4. What are the default fields that will be synchronized from SDP into Zoho Reports Reporting Database? SDP data from the following fields will be synchronized by default into Zoho Reports. No, you can't add custom columns or new fields to the SDP database tables in Zoho Reports, as of now. We plan to support custom fields/columns in a future update. 6. Can I edit the SDP - Zoho Reports synchronization setting? Modify the Initial/Additional Setup settings as required, and then click Save. 7. Can I synchronize the SDP - Zoho Reports data instantly? Yes, you can synchronize the SDP - Zoho Reports data instantly when needed. You can do this as follow. Click Instant Sync link. SDP data will be instantly synchronized. Note: This option can be used up to 7 times per day. Once the initial data import/synchronization between SDP and Zoho Reports is completed successfully, you can start accessing the reports created in Zoho Reports and also create your own reports & dashboards, as described below. Zoho Reports, with 'ME ServiceDesk Plus Analytics' reporting database will open in a new browser tab. You will be prompted for login, incase you are not already logged into Zoho Reports. This reporting database has all your SDP data and the default reports & dashboards. SDP users with permission to view the Reports tab, can see the Zoho Reports button in the Reportstab. Oher than this, your SDP administrator has to enable sharing to your account in the Zoho Reports add-on. (Refer How to Share Reports & Dashboards question). Refer How to Share Reports & Dashboards to know about how to share reports and dashboards to other users in this add-on. 9. How do I create my own reports with this add-on? You can easily create your own reports using the Zoho Reports add-on by dragging and dropping the appropriate columns from the data tables (that contain SDP data) that have been shared with you. You can refer to the below presentation to know how to create your own reports & dashboards using Zoho Reports. Note: For creating your own reports using this add-on, you can do it only if your administrator who has setup this add-on, has shared the tables (that contains the SDP data) in Zoho Reports to your account. Refer How to Share Reports & Dashboards question. By default, the reports you create are accessible only to you. However, you can share the reports with your colleagues using the Sharing options available in Zoho Reports. Refer to the How to Share Reports & Dashboards question. 11. What are the modules on which I could create reports using this add-on? Data from the following 3 modules of SDP get synced with Zoho Reports. Each of the above modules data is stored as a 'Table' in Zoho Reports. Default reports are based out of the above 3 modules (tables). You can create your own reports & dashboards over the above modules. We plan to support synchronization from other SDP data (like survey data, custom fields etc) too in the near future. 12. Will other data from SDP be supported, for report creation through this add-on. When? We plan to support synchronization of more SDP data (like survey data, custom fields etc) in the near future. Support for other data will also be prioritized based on user demand. It will be setup in the Zoho Reports account that the SDP Administrator creates and uses as part of thesetup process of this add-on. It is this account which will serve as the master admin account of Zoho Reports. At present, we do not provide this option. Please do mail to support@zohoreports.com. We will understand your needs and assist you on this. Zoho Reports supports a wide variety of reports. When you setup/configure the Zoho Reports add-on, 80+ default reports/dashboards are automatically created. These hand-picked reports will be pretty useful in analyzing your service desk performance effectively. For example, SLA compliance reports, Top 5 / Bottom technician report, Requests flow trend, Average Response time, Requests Closing Rate etc. Yes, you can modify the default reports. If you are the SDP administrator who set up the Zoho Reports add-on, or a 'Database Owner' (Refer Managing Users in Zoho Reports), click the 'Edit Design' button in a report's toolbar and you will be able to make the changes. If you are just a user who's been shared the report, click 'Save' -> 'Save As' and save the report as a new report. You can edit this copied report now. You can create any type of report with this Zoho Reports add-on. All you have to do is open the appropriate module table(s) over which a report is to be created, click 'New' and choose any type of report you would want to create. Use the intuitive drag-and-drop based designer of Zoho Reports to create the report required. To know more, view this slide show on "How to Create Reports?". You can also quickly view the type of reports & dashboards that are created by default, from the sample given below. 5. How to create reports using fields/columns across different tables (example Request & Tasks)? Columns from across different tables can be dragged and dropped to create a report. Refer this slide show on How to Create Reports? 6. What are Formulas in Zoho Reports? Formulas, as the name indicates are calculations (metrics) that you could define in Zoho Reports to help you create the required reports. Zoho Reports provides a powerful formula engine to create any type of calculations required, to enable creating the required reports. You can create formulas as easy as you would create a formula in a Spreadsheet like Excel. Refer Adding Formulas in Zoho Reports to know more. 7. 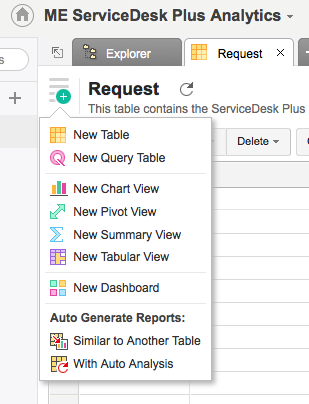 What are the default formulas added in the 'ME ServiceDesk Plus Analytics' database, on setting up this add-on? The below table lists all the default formulas that will be created in the 'ME ServiceDesk Plus Analytics' database by default. You will find these formulas pretty useful, in creating reports & dashboards in Zoho Reports. Also these formulas are used in the reports created by default in your database. You can view them by selecting the corresponding table and click "Add -> Edit Formulas" in the toolbar. Time Spent in Hrs Custom "Time Spent" / (1000 * 60 * 60) Provides the time spent on a request (work item) in hours. Time Elapsed in Hrs Custom "Time Elapsed"/(1000 * 60*60) Time elapsed in hours for closed and resolved requests, as given by SDP. This excludes holidays, weekends etc. Time to Respond in Hrs Custom if(isnull("Responded Time") = 0 , (unix_timestamp("Responded Time")-unix_timestamp("Created Time"))/ (60 * 60 ),NULL) Total time taken in hours to respond since the ticket got created. Completion Age Tier Custom if(isnull("Time Elapsed in Hrs"),'Not Resolved',if("Time Elapsed in Hrs" <= 2 , '0 - 2 Hours', if("Time Elapsed in Hrs" > 2 and "Time Elapsed in Hrs" <= 5, '2 - 5 Hours', if("Time Elapsed in Hrs" > 5 and "Time Elapsed in Hrs" <= 10, '5 - 10 Hours','Above 10 Hours')))) Different age tiers, of when requests get closed/resolved. Days Since Last Change Custom if(isnull("Last Updated Time")=0,datediff(now(),"Last Updated Time"),datediff(now(),"Created Time")) The number of days between when a request got last updated and now. Last Activity Request Age Tier Custom if( "Days Since Last Change">=0 and "Days Since Last Change" <=30 , '0 - 30 Days',if( "Days Since Last Change">30 and "Days Since Last Change" <=45 , '31 - 45 Days',if( "Days Since Last Change">45 and "Days Since Last Change" <=60 , '46 - 60 Days',if("Days Since Last Change">60, 'Over 60 Days','Invalid Age')))) Different age tiers, of when requests were last updated. % of Requests within SLA Aggregate ("Request". "Requests within SLA"/count("Request". "RequestID"))*100 The % of requests which fall within the SLA. % of SLA Violated Aggregate ("Request". "SLA Violated Requests"/count("Request". "RequestID"))*100 The % of requests which violated the SLA. Requests within SLA - Closed Requests Aggregate countif("Request". "Request Pending Status"=0 and "Request". "Overdue Status"=0) The total number of closed requests which fall within the SLA. SLA Requests Violated - Closed Requests Aggregate countif("Request". "Request Pending Status"=0 and "Request". "Overdue Status"=1) The total number of closed requests which violate the SLA. % Escalated Requests Aggregate ("Request". "Escalated Requests Count"/count("Request". "RequestID"))*100 The % of requests which got escalated. % Reopen Requests Aggregate (countif("Request"."ReOpened"=1)/countif("Request". "ReOpened"=1 or "Request". "Request Pending Status"=0))*100 The % of requests which got reopened. Reopen Requests Count Aggregate countif("Request". "ReOpened"=1) The total number of requests that got reopened. Refer to the Adding Formulas in Zoho Reports help page. 9. Can I add/modify data to the SDP tables from within Zoho Reports? No, you cannot. Data from SDP gets automatically synched into Zoho Reports in the 3 different tables. You cannot edit any of this data or add new data records from within Zoho Reports. 10. Can I add new columns to the SDP tables from within Zoho Reports? No, you cannot add new columns. But you can add Formula Columns and Aggregate Formulas (i.e. calculated fields) to these tables to help you create powerful reports. Refer Adding Formulas in Zoho Reports to know more. Yes, you can add new data tables. Click New > New Table and you can add new tables to the existing SDP reporting database. With this feature, you can import new data or add them manually into your reporting database to analyze and create reports combining this with the SDP data. You can import data from files & feeds like Excel, HTML, CSV, JSON, XML, Google Drive, Zoho Docs, Dropbox, Box and Web URLs. You can also import data from Local SQL & NoSQL databases like Oracle, SQL Server, DB2, MySQL, PostgreSQL, MS Access, Hadoop, Cassandra etc,. The databases can also be in the cloud. Zoho Reports allow you to pull the data required by writing standard SQL SELET Queries. This feature is called Query Tables. With Query Tables you can also combine data from different tables and create reports from the same. View this demo video to know about how to create Query Tables in Zoho Reports. If you are just looking to join tables to create reports, you can use easy to use auto-join feature in Zoho Reports, instead of Query Tables. Refer to Joining Tables in Zoho Reports for detailed help on this. 13. Can I join data from multiple tables to create reports? Yes, you can join data from multiple tables to create the reports. Refer to Joining Tables in Zoho Reports for detailed help on this. 14. How do I generate a bookmark URL or permalink for a report or dashboard? Zoho Reports allows you to have a (semi-) private link for any report or dashboard. Click the Publish icon -> URL / Permalink for this view. To bookmark the URL for the report/dashboard, get the URL for the 'without login' option. The report link has a unique privatelink key as a part of it. You can bookmark the above URL for accessing the report/dashboard any time. Note: If you want a more secure link, use the 'with login' option. This will ask for the users to log into their Zoho Reports account and will be accessible only if you had shared the report to them. To know more, refer to the Creating URL/Permalink to Views help doc page. You can share the default reports provided in the Zoho Reports add-on and also the reports you create, with your organization employees/colleagues. Refer to Sharing and Collaboration help page for more. Clicking the link will open the ME ServiceDesk Plus Analytics reporting database in a new browser tab. They will be prompted to log into their Zoho Reports account, incase they are not already logged-in. Users will be able access the reports & data shared to them. 1. If you share the data tables in the SDP reporting database to users, they will be able to create their own reports over the same. 2. If you add a user as a Database Owner in the SDP reporting database created in Zoho Reports (ReferManaging Users in Zoho Reports, to know how to add Database Owners), the user will be able access all the data & reports, create new reports and do any operation that you could do on the reporting database. When the SDP Administrator configures the SDP - Zoho Reports add-on, the tables and reports will be available only to him/her, by default. The Administrator has to share the 'ME ServiceDesk Plus Analytics' database with other members of the organization. Only then will the default reports be accessible by those members. There could be a another case where say the Administrator has shared the database with other members in the organization. And the member creates his/her own reports. Those reports will be available only to him/her alone, unless he/she shares them with others. The SDP Administrator who setup the add-on should share the tables present in ME ServiceDesk Plus Analytics database with other members of the organization. Once this is done, the shared users can create reports based on those tables. 2. Database Owner: The Administrator can designate one or more users as Database Owners. A Database Owner has all permissions to add, delete, modify reports, table rows and even tables. A Database Owner can share the database tables/reports with other users. A Database Owner cannot delete or rename a database. 3. User: A user has the least privilege in the hierarchy. He/She can access the reports, dashboards & tables which are shared to them by the Administrator/Database Owner. Users can access the shared information only by log-in into his/her account in Zoho Reports. Unless the Administrator or a Database Owner shares a table with a User, the user cannot create any reports on his/her own. Also, an Administrator/Database Owner can decide to set specific permissions when sharing a report (Read Only, Export Data, View Underlying Data, Share with Others) or a table (Read Data, Export Data, Add/Delete/Modify Rows, Share View / Child Reports). Refer to Managing Users in Zoho Reports, to know more about different user roles in Zoho Reports. Also refer to Sharing and Collaboration help page. This is the expected behavior. If the user being shared to is a database owner, he/she can edit the reports. If a normal user wants to edit report, what he/she can do is to use 'Save As' to save the report in a different name in his account. This report can then be edited. Yes, you can. Refer to this help documentation section to know how this can be done. To print a report/dashboard, please follow the below steps. You will see options to save the report/dashboard in a variety of file formats like PDF, Excel, CSV, JPG etc. Choose the format you want and save the file to your desktop. For printing PDF is the recommended format. Note: If you are a user to whom a report has been shared and you want to take a print, ensure you have been provided the Export permission by the Administrator to the report, only then you will be able to print the report. Reports and dashboards can be exported in a variety of file formats. 10. How do I embed my reports in my website, intranet, blog or presentation? Select the report or dashboard that you would like to embed into your Website or Blog. By default, when you embed the report into your website, intranet, web application or blog, it would prompt for users to log into Zoho Reports to view the embedded view. Also, users to whom you have shared the view (using the 'Share' option) would only be able to access the view embedded, on successful login. Copy and paste the code snippet provided in the text area below into your webpage or blog html content to embed this view. On embedding, you will see the corresponding report within your web page, application or blog. ReferEmbedding in Web Pages/Blogs to know more about this.